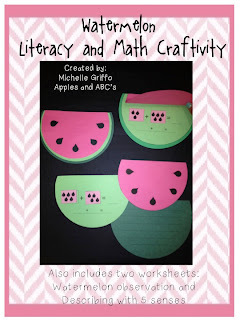 I am excited to post our Watermelon Craftivity! The kids were so excited to explore a watermelon using our 5 senses. I think a great way to teach the 5 senses in kindergarten is using food because they can taste, smell, feel, hear, and see it! 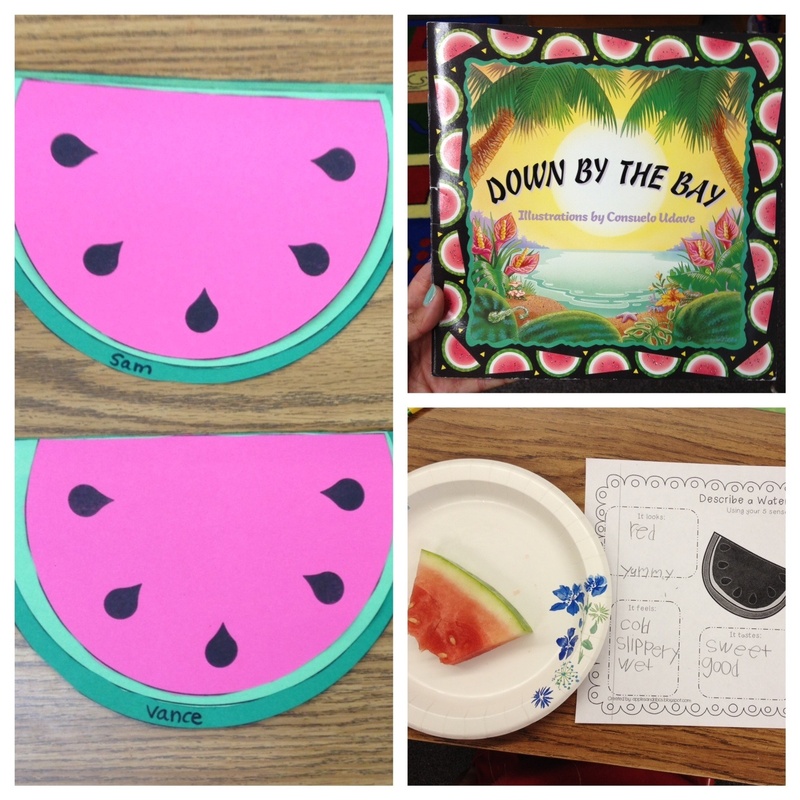 We used the watermelon project that I made for the students to use as a graphic organizer when using their 5 senses. 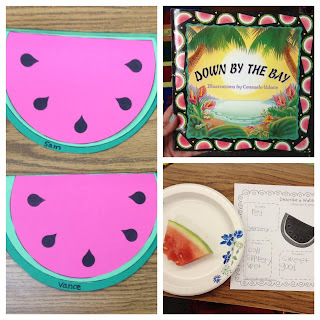 I started our watermelon lesson by reading Down By the Bay, which is also a fun song to sing with the kids. After I read the book, I let them make up their own rhymes to make a cute chant. Then it was time to use our 5 senses and describe the watermelon. I gave each child a slice and the worksheet that I made. We wrote down adjectives to describe it! After our watermelon tasting, we made the watermelon craftivity! The students wrote sentences on the bottom layer of the watermelon. Our second layer was used to make a math addition sentence by counting watermelon seeds. The final step was to glue the fun cover on! Each layer is glued at the top, so they can flip up and you can see the math and language arts layers. 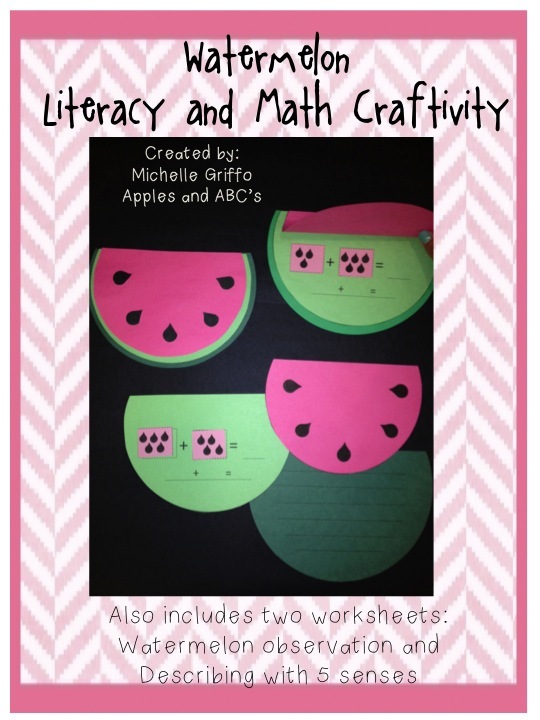 If this is something you would like to do with your class, follow this link to my TPT store and pick one up! This such a great and cute theme, feel better! Super cute! I love that book and song. Awesome ideas! I love your blog and am your newest member! Come visit me sometime! How cute is that! I love these ideas. I put this packet on my wish list because I want it for next year. Thanks for sharing! I would say that you can even study that writing resource subject to learn more about the way to write something. Here boomessays review is the best review website about them. You can read about ways how those writing resources work and learn more about the usage of writing websites. On that website, you will find all the information about rates, writers and so on. Check it if you have some question about writing. Blog Swap Guest: A Cupcake for the Teacher! Olympic Rings and THIS SATURDAY!! Letter T: Best YouTube Video EVER!!! Time for a SHOUT OUT! What I Am Pinning Wednesday! Made It Monday Linky: Ring My Bell! Oceans of Fun: Art in Kinder!